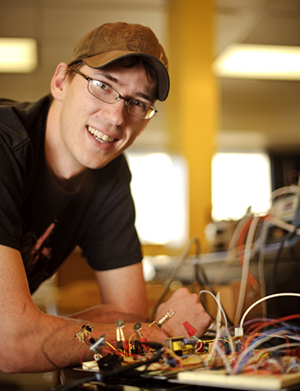 The University of Wyoming’s Department of Electrical and Computer Engineering is well known for its strong laboratory program. The laboratory experience is the heart of a good engineering education, and the facilities in Electrical a nd Computer Engineering at the University of Wyoming are exceptional. The Electrical and Computer Engineering Department’s curriculum is very lab-intensive. Labs are updated, remodeled, and maintained continuously to keep up with the rapidly changing field of electrical engineering. Teamwork between course instructors and staff ensure that necessary parts and test equipment are available, and laboratory teaching assistants, typically graduate students, ensure equipment is functional and that students understand how to operate the equipment properly. The following is a list of the department laboratories and some of the updates that have been made recently. This laboratory supports our new Industrial Controls and Process Controls courses. These courses and laboratories were developed in direct response to demand from our advisory council in support of industries throughout the State. The lab renovation involved significant upgrades to the laboratory facility itself and the installation of the laboratory benches and equipment. The target device for the laboratory is the Allen-Bradley SLC-500 Programmable logic controller, avery common PLC used throughout industry. In addition to the PLCs, power supplies, signal generators, oscilloscopes, and personal computers used to program the PLCs were also added. In addition to the primary Industrial Control lab, the Wyoming Motor Center houses the new large process controls experimental apparatus. This two-tank level control system gives students hands-on control of a process similar to one they may see in industry. tware development systems, and the development systems for microcontroller programming. This lab is used to support a number of different classes including Bio-Instrumentation, Communication Theory, Image Processing, and Digital Signal Processing. The majority of the equipment on the benches in this lab was replaced approximately 5 years ago, and is still very functional for the courses it supports. The Basic Circuits lab has been significantly upgraded. Six new laboratory benches have been installed, with updated electrical connections. In addition, lab equipment including oscilloscopes, function generators, frequency counters, and multi-meters have been replaced with updated models. control schemes and analyze the results. In the summer of 2013, new computers were purchased for this lab. During the last computer replacement cycle, the number of computers in this lab was increased from 12 to 16, and dual monitors have been installed on all of the workstations. This has been very popular with the students, and makes working on many different types of reports and designs much easier. New chairs, carpet, lighting, and electrical, have all added to the environment of the lab. An overhead projector has also been installed to allow class demonstrations. This lab has been fully remodeled, including new computers, tables, chairs, carpet, and lighting. The number of workstations has been increased from 4 to 6, and dual wide, flat-panel monitors have been installed. This has eased the congestion in the main lab, and increased the total number of workstations available in the lab area from 17 to 23.
updated, and all of the labs redeveloped for the latest developer’s tools. New development boards for the Microprocessors class, the Digital Systems class, and the Advanced Digital course, have all been integrated into the labs. A new network device programmer has also been integrated into many of the labs. This computer-based classroom received new computers during the summer of 2013. A new SmartBoard presentation system has also been installed. This lab is primarily used for computer engineering courses, but is also used for other classes that need the computer demonstration capability.